I would definitely say that you are going to love this recipe for sure. An easy recipe with foolproof technique to make every time the homemade buffalo chicken right on your table. Forget getting it from restaurants or stores. Start making it at home and enjoy by customizing it to your individual preference. Homemade recipes are always to be preferred for its reduced fat content. There are zillions of recipes available online for homemade buffalo chicken. Everyone of the recipe has its own positive and negative values. Some are easy and some more complicated. But choosing a perfect recipe is very difficult. Rather than the recipe the tips and secrets would always helps to get the perfect dish whenever we make it. 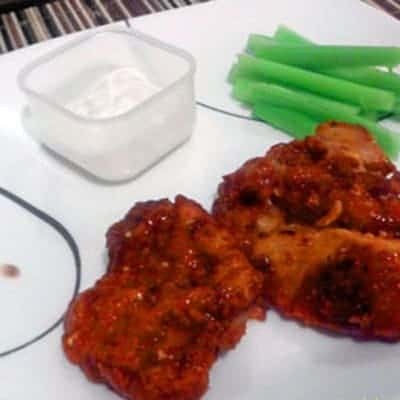 I wanted to make a crispy buffalo chicken which is crispy outside and tender on the inside but little effort and with the minimal ingredients. Do you think is there a recipe with these constraints? I have a perfect answer that this recipe would give you a great tasty homemade buffalo chicken with very minimal effort from your side. What does you can make with homemade buffalo chicken? This question seems to be silly one for me as this dish can go in with any dish perfectly. It can go in burger, can go into your sandwich, can make into your wrap. If you are planning to make a wrap, lightly toast store-bought tortillas on both sides. It the center keep this homemade buffalo chicken along with the lettuce, chopped onion, tomato, and corn kernels if you have. Roll and make a wrap. Serve it with mayo or any other creamy sauce. This will definitely beat up the taste of any restaurant style wrap. The above paragraph is is just to give you an idea how this homemade buffalo chicken can be converted into an exotic dish. Just run your imagination and try other dishes by having this chicken as the base ingredient. When my son goes for restaurants, he always prefer to have buffalo chicken pizza, wrap, or sandwiches. This shows how my son loves toward this. Even I can not stop myself from appreciating or enjoying this dish, now, again and forever. Homemade buffalo chicken is our all time favorite, as a snack, appetizer or even aa main course. Can I freeze the leftover homemade Buffalo chicken? Yes, of course. You can freeze them in an airtight container or Ziploc bag. It stays good for about a month. You may reheat it by using microwave or stove top method. Can we buy your buffalo chicken dip? Get a store bought is very easy. But I would like to tell you that making dip is not that difficult as you think. It’s so easy that you can make within 5 minutes of time. All that you need is hot sauce that costs couple of dollars. Mix it with creamy ranch or mayo. That’s it, this is so simple right? How to cook buffalo chicken? Buffalo chicken can be cooked either by frying the chicken in the oil or by baking. I would like to bake. Which helps to to avoid few more calories caused by the cooking oil. And also I feel that baking provides a beautiful texture to the dish. What goes with homemade buffalo chicken? Buffalo chicken can be served as a standalone appetizer or as the main course. Celery and juicy carrots are the important companions. Blue cheese, ranch, mayo are the other best pairs. Ranch is my most favorite side for buffalo chicken. Always go for the fresh meat to make the homemade buffalo chicken. If you have frozen meat, then thaw them before the marination. Making with a fresh chicken is always turn out so good, that is exactly similar to the restaurant’s quality. For those who are wondering what buffalo chicken is, a crispy chicken coated with a spicy and tangy sauce. The word Buffalo comes from the place where the sauces originated in. ‘Buffalo chicken’? it sounds weird when I first heard it. Whether it is beef? or giant size chicken pieces?, I was clueless when I first ordered it. But actually, it was regular fried chicken wings dipped in fiery hot sauce, but originated in a city called ‘Buffalo’ in New York. I think it is perfectly suited for Indian palates. My son loves to have in his pizzas, subs, wraps…He also pulls out big packs of ‘ready to eat’ from the store’s shelves. To avoid processed food I made him this homemade buffalo chicken, but with the little modification, I went with the chicken boneless thigh pieces. Homemade recipes are always to be preferred, as it is healthy and also we can reduce the fat content. This recipe always turns out well and ends up in finger licking. Looking for other interesting chicken recipes? Have you ever tried juicy lemon grilled chicken, Cedar Plank grilled salmon or grilled lemon salmon which are equally easy and tasty? This is so easy recipe with foolproof technique to make every time the homemade buffalo chicken right on your table. Forget getting it from restaurants or stores. Start making it at home and enjoy by customizing it to your individual preference. Wash and clean the chicken and cut into medium size pieces..marinate with garlic, salt, and herbs for 30-45 min. Whisk 2 eggs slightly in a bowl. In other two plate have all purpose flour and bread crumbs. Now dip chicken pieces in the egg batter. And again dust in bread crumbs.....remove the excess. Fry the chicken in oil for 3-4 min and in slow flame for about 5-6 min or till the chicken is done, by flipping them occasionally. Drain the chicken out of the oil, when it becomes golden brown in color. Toss the chicken strips well in buffalo sauce. Serve it with ranch/mayo / blue cheese with celery sticks. Enjoy your boneless homemade buffalo chicken.